nia inspector posts recruitment 2019 - Government Jobs, Sarkari Naukri, Sarkari Result, Admissions, Rojgar, Exams Alerts. Two years’ experience in handling of cases of investigation of criminal cases, or intelligence work or operations or Information Technology cases or Training in counter terrorism. With 6 years’ service in the grade rendered after appointment thereto on regular basis in the Pay Band-1 of Rs. 5200-20200/- with Grade Pay of Rs. 2800/- in the parent cadre or department. Experience of two years in handling of cases of investigation of criminal cases, or intelligence work or operation or Information Technology cases or Training in counter terrorism. 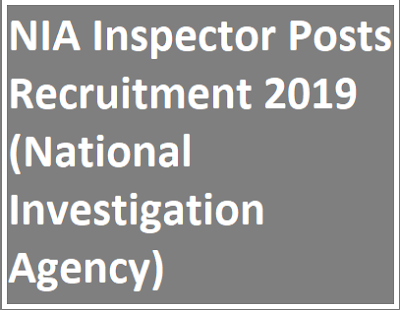 Eligible candidates may send their Bio-data/ application form in the prescribed proforma Annexure-II to SP(Adm), NIA HQ, Opposite CGO Complex, Lodhi Road, New Delhi-110003 on or before 12th April 2019.